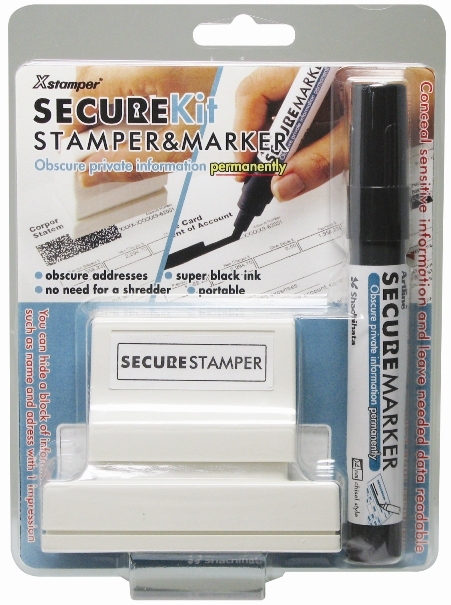 Secure Kit - Stamp & Marker Combo - Stamp Impression Size: 15/16" x 2-13/16"
Protect yourself with the Xstamper secure stamp combo. This is your newest weapon against identity theft! This combo includes the secure pre-inked stamp and the secure marker. The marker has a durable 4mm chisel nib tip. Use the Secure Marker for accuracy and use the secure stamp for speed! Re-Inking Stamp Instructions: Remove the top and place 3 to 4 drops of ink into the openings of the stamp.